"Many candidates receive donations from PACs and SuperPACs, but the money is hard to trace. Can you do a visualization on PAC giving?" You are correct – many candidates receive a substantial portion of campaign money via political committees. In last year’s General Assembly elections, giving by political committees represented just over half of the $54 million raised. By definition, a PAC pools money from multiple donors and then redistributes them. If a candidate receives a donation from, say, the Virginia Nurse's Association PAC, the public has a pretty good idea of the money's source. All PACs -- even the so-called federal “Super PACs” – are required to disclose where they get their money. But there’s no easy way to draw a bright line from money a PAC receives to money that a PAC distributes to a candidate. But that is not becuase PACs are doing anything illegal or even dodgy; that is just what a PAC does – aggregate and distribute money. 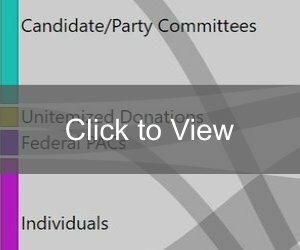 52% - Donations from party committees, other candidate committees and political action committees and Super PACs. 8% -- Donations from undisclosed sources. (This consists of a) small donors who gave so little -- $100 or less-- that the law does not require their identifies to be disclosed and b) so-called “social welfare" organizations that under federal and state laws are allowed to engage in a limited amount of political activity without but disclosing their donors.